©Neil Turner/Bupa 10,000. May 2015. 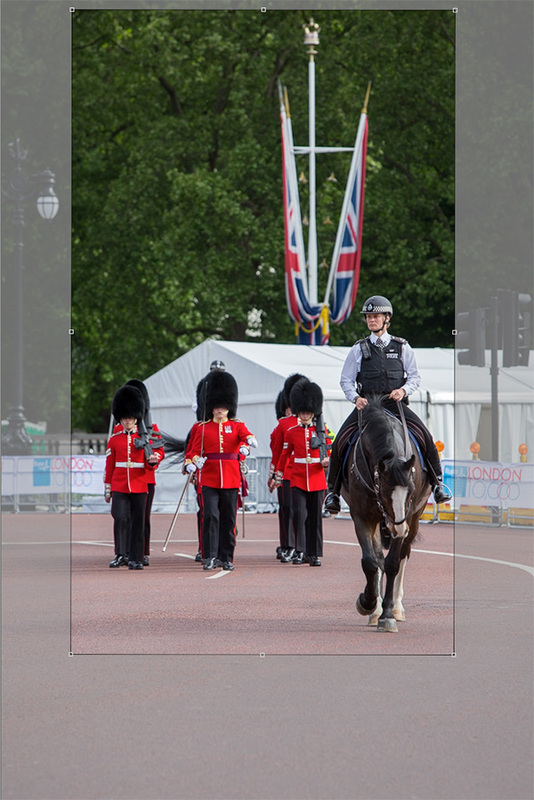 A Police rider accompanies a detachments of Guards as they march back their barracks. I was on a job the other day, standing next to a very young photographer in a ‘press pen’. He glanced over at the gear I was using and mentioned how much he would love to own the 135mm f2L lens that I had on one of my cameras. He said that he had never really got the hang of “zooming with his feet” in the way that so many of the photographers he admired had advised. He had also had it drummed into him by one of his tutors at college and it had left him wondering if he was doing something wrong. Zooming with your feet is a great concept and it is one of the catchphrases in contemporary photography that appears to be beyond question. But is it? Is it actually as much a cliche as a universal truth? There we were on a job where we couldn’t have zoomed with our feet even if either of us had the skills to do so. We couldn’t go forward – there was a metal barrier in the way. We couldn’t go backwards because there were other photographers and a couple of TV crews behind us – and behind them was another barrier. We had a tiny amount of sideways movement if we could change places with each other but, apart from that, we were in a very fixed position. The event we were shooting was a fixed distance from us and so it was possible to get the right prime lens on the camera and then to shoot the job. What my young photographer friend didn’t know was that I had my 70-200 lens in my bag but that I had some real concerns about its performance earlier in the day which is why I had grabbed the 135 and decided to use that. As we had plenty of time to spare I explained my choice of lens and explained that a lot of press work means that zooming with your feet is somewhere between difficult and impossible and that to get the most from a fixed position a set of zoom lenses is actually the right choice. I went on to admit that I would be doing a fair bit of zooming on the job myself, except that it would be in the post-production – zooming with the crop tool is what I decided to call it. And that’s what I did. The resolution of modern DSLRs is such that you can get a high quality Jpeg from 50% of the actual frame and the quality of the best lenses easily allows you do that and maybe more. Starting off with a lens wider than you probably need and then refining your crop in post-production was very common in the days of darkrooms and prints but when we were shooting 35mm colour transparencies or with the early low-megapixel digitals it became important to get the crop right in-camera. We have come full circle and some judicious cropping makes sense once more. Shooting with prime lenses is something that I have discussed more than once before and it is something that I find myself doing more and more on jobs where I’m the only photographer or where I have enough freedom to go with the universal truth/cliche (delete where applicable) and actually zoom with my feet. The rest of the time it is zooms and now that I am using two distinct sets of lenses for different types of jobs I’ve decided to invest in some new gear – and I’ll be blogging about that very soon.